The LG V20 will make its official debut next month, but before it does, one Reddit user may have spilled some of T-Mobile’s launch plans for the flagship device. T-Mobile is currently planning to begin pre-orders for the LG V20 on September 14, claims Reddit user Jordanpeterson234512. The launch is currently penciled in for September 23, and the price will allegedly be $650. According to the documentation that Jordanpeterson234512 saw, there will be a few bonuses available to pre-order customers. They’ll purportedly include an extra battery and “Enhanced Hand Grip,” a “Memory Module Attachment,” and one year of Hulu plus three Vudu rentals. The third one will allegedly be a T-Mo-exclusive offer. T-Mobile currently offers three gifts for Galaxy Note 7 buyers. Those folks that buy a Note 7 before August 28 can choose either a Gear Fit 2, 256GB microSD card, or free year of Netflix with their phone. LG has offered free gifts for people that buy its flagships in the past, and so it’s certainly possible that we’ll see LG offer gifts to V20 buyers as well, with T-Mo offering in a special gift of its own. 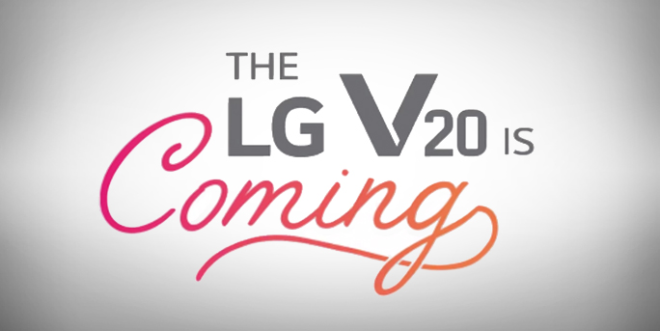 The LG V20 will be announced on September 6. LG has said that it’ll be the first phone to launch with Android 7.0 Nougat out of the box and that it’ll have a 32-bit Hi-Fi Quad DAC for high-quality audio with compatible wired headphones. 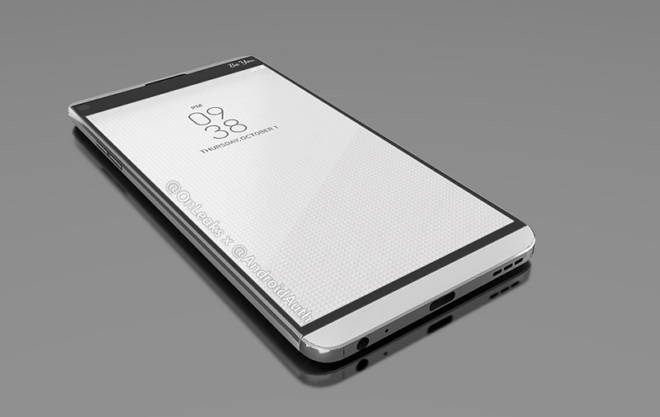 Leaked renders of the LG V20 have suggested that it could borrow some design cues from the LG G5, including support for swappable modules. Love the look of this phone! Hopefully LG has ironed out the hardware issues that plagued some of the G4/G5/V10. The hardware issues really hurt, what otherwise, is a really awesome device. I think LG could have done this phone a little more justice by giving pre-orders better gifts than the latter mentioned above. This is supposed to be a flagship device, hence, give buyers more incentive to get it as soon as it launches. And the design could have stuck to the same design flares as the LG V10. I want people to be able to differentiate what I have rather than assume I have an LG G5 which is coherently similar to this. I think LG took a nose dive with this phone. Same with Sammy…..the Note 7 is hard to differentiate from the Edge series unless you pull the pen out. I’m disappointed. The LG V10 was innovative and I expected more for the LG V20. This to me is coming up short. I’m sure others would disagree but I’ve owned all the models and the feel of the LG V10 along with its specs is what sold me. I switch between phones but the LG V10 is my daily driver. I will use Samsung here and there but my Edge just sits more than anything. LG did not sell me on the V20. To each thier own I guess. They’re offering more then enough versus Samsung, hell Apple doesn’t offer anything at all. No one recognizes an LG device, all they think that exists is iPhone and Galaxy, so don’t worry about getting confused with an LG G5. Don’t worry so much about what others think, with that thinking I’d have a sub par Apple phone and watch combo. What else did you want from the V20? All devices this year were mediocre. I would have liked to see LG offer their smartwatch and or a BOGO promo with the release of this phone. The enhanced hand grip can be compensated with a good case on the phone; the memory module can be compensated with a better SD card; and lastly, the extra battery can be compensated with a power bank. All of those extras don’t seem so much appealling after the fact. An LG smartwatch or other hardware such as a 3D accessory would have gotten me on board. At the moment, all of those free extras are just typical garnishes. Nothing special that rings…..BUY ME!!! Simple things that you can get for a lot less. Sorry but this doesn’t do it for me and neither do those 3 vudu rentals. Just NO!!! LG Urban 2 Watch yes! Agree on watch part! That’s an insane attitude. All of the devices this year gave solid performance, had a great camera, good battery life and excellent screens. They were only “mediocre” because they didn’t differentiate enough from one another – compared to all previous years, this years devices were all exceptional and left nearly no areas to complain about. They brought nothing new to the table. The best device in the US is the OnePlus 3 because of its 6GB RAM. That’s sad. All others fall short, and the OP3 is still missing front facing speakers. ALL the devices released still have subpar battery life. And all we’re getting this year is 820 devices, not even the Nexus will step it up with its late release. They brought the most important thing to the table, the thing that everyone has been asking for for years: no weak points. Up until this year, every phone has had a “it’s great, except for this” caveat in its reviews. Could have been battery life, or the camera, or the performance, or the design, but there was always something. All of the flagships this year have been without a major gotcha point. Sure, the speakers are weak, but the amount of time spent listening to anything on the speakers vs headphones makes that a minor concern. You want some big wiz-bang feature, I get it, but you are going to be disappointed from here on out if that’s all you care about – there’s just nothing left to add that’s not going to be a drain on the battery that doesn’t get used (remember the Galaxy S4 with its long list of sensors and features that everyone turned off to keep the battery life up, most of which disappeared in the next device?). We are past that in the phone market, and are now in the maturation phase of the industry, where they make subtle improvements and refine the experience. If you keep going with your attitude, you get where the iPhone is today – they keep making it thinner even though people stopped caring about thin years ago, and adding features like force touch that drain the battery constantly but don’t actually add much to the experience. Plenty of weak points with OP3. Hehe, true. That’s why I mentioned them as flagships, which the OP3 is simply not. It’s a midrange phone trying to be one while keeping the price down. Maybe they will have the kinks worked out next generation. It has a midrange price, but not midrange specs. There’s no other device with 6GB RAM in the US. Glad to see you could come back with a less condescending response than what the mods had to delete from you. And I don’t do iPhone mediocrity. If you’re a small company releasing something for the first time before the major players you’ll run into issues. At least they tried and fixed it along the way. And your Edge won’t ‘smoke’ it. Oh so your feelings got hurt. Show me where the internet hurt your feelings. Good god, grow a pair. By the way, yes the edge 7 smokes the pile of crap phone. Typical thinker…..vanity and greed are all that ppl are interested in now a days. So sad…..if what i see is what its going to be…IM IN!!! #letsgetit and STOP all the talking!! Not sure I can trust LG after the hardware reboot debacle for the G4. Worse off my brothers LG G4 reboots itself after an update for AT&T. LG really has a lot to do in regards to improving software and hardware. Its kind of annoying cause they have made some nice phones lately. Same thing happened to my friend’s G4. His replacement got it eventually as well. You think the G4 was bad, you should have seen the G2x. There wasn’t really one thing that phone did right other than the Nvidia Tegra chip being the most powerful thing around. Problem is that it was totally unstable and LG literally abandoned it once they realized they couldn’t fix it. 512MB was plenty back then. The major issues were the freezing, reboots, and the GPS that never worked, out of the box or otherwise, and the battery was horrid. LG dropped it and swept it under the rug when they should have recalled it. Actually it shipped with Froyo and was upgraded to Gingerbread. Gingerbread only required 128MB of RAM to run and the Sensation was fine despite the fact that while it was a 768MB RAM device, 128MB was given to the GPU. Forget the watch! How about a BOGO deal? But still on EIP because I don’t have money to pay in full. I just need something new to prove something. What planet are you living on where you expect a BOGO on a FLAGSHIP RELEASE? Just wait 4-6 months and this will drop to $499! S7 Edge was BOGO FREE at launch. Your response made me spill my drink, lol. Last time I had an LG was the LG G2X, this phone left a bad taste in my mouth and I’ve not touched an LG phone since. this V20 would need to be something special. I heard lots of good things on the V10, lets see what this phone has to offer. My exact same position. I swore never again on LG after they abandoned the G2x which forced me to pay outright for a less speced out HTC Sensation so going back to LG would be tough for me. I had the G2x for a bit. It wasn’t great. Few years later got the G3 and it was actually a pretty great phone. I’d give LG another chance. My last LG phone was a G2. Despite it being 2 generations ago, I still like that phone better than the iPhone 6 that my employer made me replace it with. Actually that would be 3 generations ago. The G5 is out now. I have had both the v10 and g5. The g5 is good at its job but nothing touches the v10. Cant wait to preorder my v20!!! This is ridiculous, LG should have given this phone to us for free…and another one…. and pay for our monthly plan….and a free watch….and a nice bottle of whisky…..shall I continue? Entitled much? Way to turn a funny comment into an idiotic one. Go away. You mean Ronald Regan, right? I highly doubt Google will allow LG to have Nougat first in their phones. With rumors of the 2 new Google phones being announced in early September and being released possibly in September, maybe this gives us a clue when the new Google phones will be released. Please no modules other than swappable battery, you handled it terribly with the G5 LG. I would love a keyboard module with an extra long battery, but in a phone with 4.7ish screen. Welp. No modules for the V20 so that leaves the accounting of this person’s take on the bonuses into question. Although, I’m hoping the time line is correct and the headphones still come with it.